If you are traveling north on Hwy 101, take the Bicentennial Exit East. Turn right at the stoplight onto Ventura Ave. Follow Ventura for two blocks to the Long Term Parking lot located on your left. 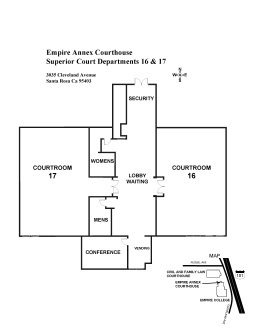 Court offices are located in the Hall of Justice, which is one block west of the parking lot. If you are traveling south on Hwy 101, take the Steele Lane Exit and turn left. Follow Steele Lane to the second stoplight and turn left onto County Center Drive. Follow County Center Drive to the stop sign, then turn left onto Administration Drive. Proceed north to the Hall of Justice. Turn left on Ventura Avenue to the long term parking lot located on your right. Parking regulations are strictly enforced. 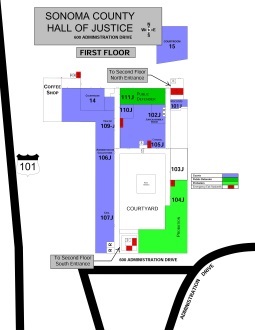 JURORS may park in the green 2 hour and 90 minute spaces. Place the JUROR PARKING PERMIT, from the summons, on the driver's side of the dash board with the current week date showing. Parking is not permitted in any other specialty zones even with your summons in the window. 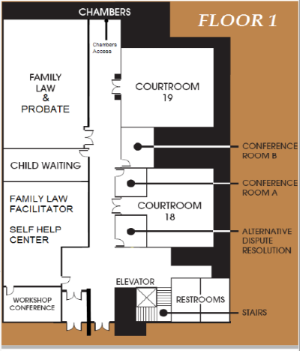 The Jury Assembly Room is located on the first floor of the Hall of Justice, in the enclosed hallway at the northeast end of the building, in Room 102-J. If you are traveling North on Hwy. 101, take the Guerneville Road/Steele Lane Exit. Turn left towards Coddingtown Mall. Proceed to Cleveland Avenue, which is the first cross street, and turn right. Turn left on Russell Avenue. Turn left at the parking lot entrance. The Civil and Family Law Courthouse is the first building on the left and the entrance is at the western end of the building, facing the parking lot. If you are traveling South on Hwy. 101, take the Guerneville Road/Steele Lane Exit. Turn right towards Coddingtown Mall. Proceed to Cleveland Avenue which is the first cross street and turn right. Turn left on Russell Avenue. Turn left at the parking lot entrance. The Civil and Family Law Courthouse is the first building on the left and the entrance is at the western end of the building facing the parking lot. If you are traveling North/South on Hwy. 101, take the Guerneville Road/Steele Lane Exit. Go west to the first stoplight, which is Cleveland Avenue. Turn Right on Cleveland Avenue. The entrance to the courthouse and college parking lots are about .5 miles on the left. If you are traveling North on Hwy. 101, take the Hwy. 12 East/Sonoma Exit. Follow the Highway 12 signs through Santa Rosa. Continue east on Highway 12. The first traffic light past Oakmont Drive is Pythian Road. Make a left onto Pythian Road. Follow the left branch of the road. This will become Rancho Los Guilicos Road. Turn right into the second parking lot. The main entrance to the Juvenile Justice Center faces the parking area. If you are traveling South on Hwy. 101, take the Hwy. 12 East/Sonoma Exit. Follow the Highway 12 signs through Santa Rosa. Continue east on Highway 12. The first traffic light past Oakmont Drive is Pythian Road. Make a left onto Pythian Road. Follow the left branch of the road. This will become Rancho Los Guilicos Road. Turn right into the second parking lot. The main entrance to the Juvenile Justice Center faces the parking area.